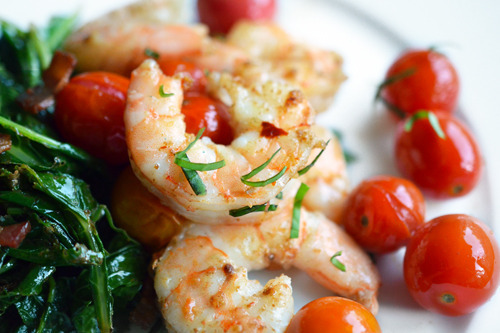 Frozen shrimp can be a godsend when you don’t know what to cook for dinner. Tonight when I woke up, I putzed around the kitchen in a daze until I remembered I had a bag of frozen shrimp in the freezer. Bingo! 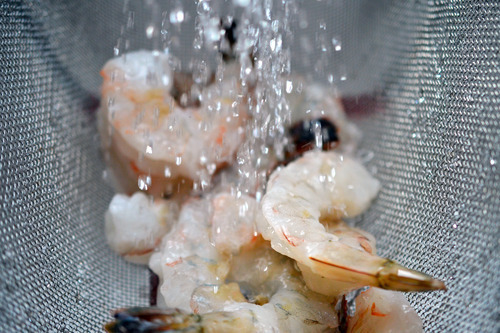 Dump the bag of frozen shrimp in a colander and run cold water over them for around 5 minutes or until defrosted. 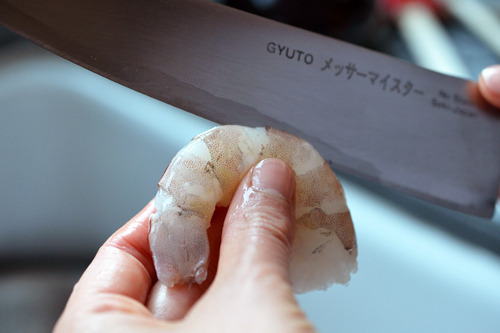 Peel the shrimp and devein them by cutting a shallow slit down the back and pulling out the icky black intestine. 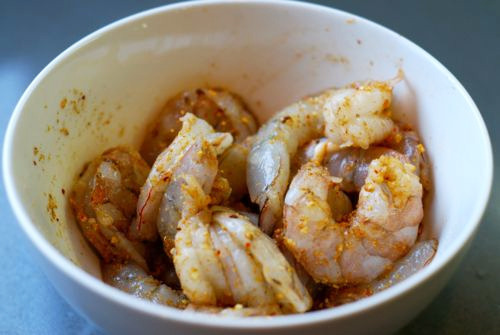 Toss the drained shrimp with Tabil seasoning, salt, and a tablespoon of macadamia nut oil. 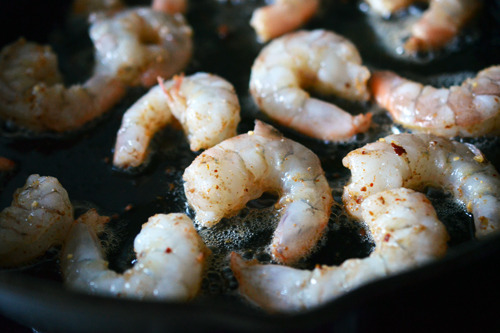 Heat up a large skillet on medium high and add the remaining tablespoon of macadamia nut oil. …about a minute on each side. 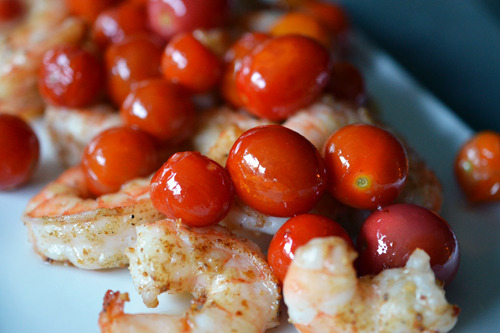 Remove the shrimp to a serving platter and toss the cherry tomatoes into the empty pan. 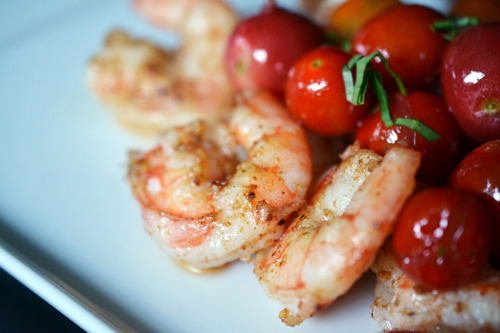 Roll the tomatoes in the grease until they’re warmed through and add them to the shrimp. 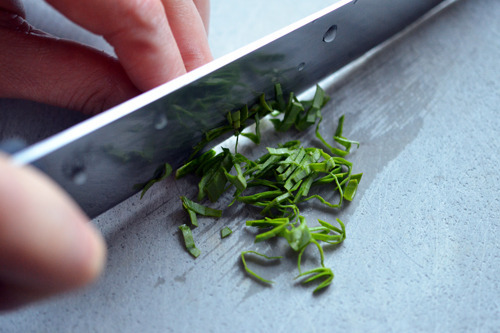 …and sprinkle it on the shrimp and tomatoes. Didn’t I tell you this dish was simple?